Dr. Shaun Thompson has more than 10 years experience practicing rural family medicine. He has been writing freelance since 2008 and has had articles published on various health and fitness websites. He earned a biology degree at the University of Denver in 1991 and his medical doctorate from the University of Colorado in 1995. Blood pressure refers to the force the fluid within the vascular system exerts on the walls of the vessels. Elevated blood pressure increases the risk of heart attack, stroke, kidney disease, blindness and death. The higher blood pressure is above normal, the greater the risk. Blood pressure should be evaluated by a competent person using an accurate, calibrated device. It should be taken in a sitting position after a person has been seated at least five minutes. A repeat measurement in a few minutes helps increase accuracy. See the first number, the systolic blood pressure. It's the measurement of the pressure in the arteries as the heart contracts to pump blood. Normal is considered below 120 millimeters of mercury, or mmHg. A systolic blood pressure of 120mmHg to 139mmHg is considered prehypertension; 140mmHg to 159mmHg is Stage 1 hypertension; and above 160mmHg is Stage 2. Understand diastolic blood pressure, measured as the heart rests to refill with blood. It's always the lower of the two numbers. The ideal level for the general adult population is below 80mmHg. Eighty to 89mmHg is defined as the prehypertension stage. Ninety to 99mmHg is Stage 1 hypertension; above 100mmHg is Stage 2. Look at both numbers together. If either is above normal, the blood pressure is classified in the appropriate stage. For example, 148/78 (read as 148 over 78) is classified as Stage 1 hypertension. If both numbers are below the prehypertension cutoff, the blood pressure is considered normal. 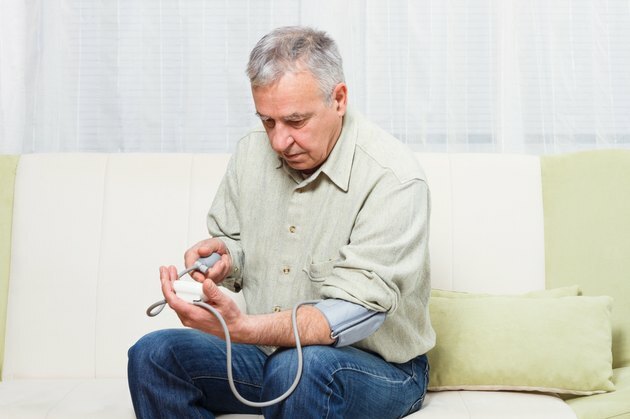 For those older than 50, elevated systolic blood pressure poses a much greater threat to health than elevated diastolic blood pressure. Lifestyle choices such as diet, exercise, and weight control correlate significantly with blood pressure. What Are the Parts of a Blood Pressure Cuff?